What is MiNeeds All About? We all know about social media sites and their usefulness as a business tool. But there are sites that have taken the basic premise of social media platforms and expanded them to previously unheard of levels. 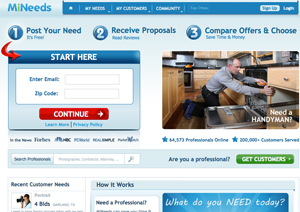 One such site is MiNeeds, a kind of yellow pages meets Facebook for people looking for professional services. So what is it all about? And can you benefit from getting involved? The internet is a potent tool that we all use for a variety of daily tasks. We interact with friends, download music, work on research, and go shopping. In the past, the kind of shopping that you did online was probably catalogue-style, where you would search for furniture or whatever you need, and then have it delivered to your home without you ever having to step outside. Convenient yes? The logical evolution of this kind of shopping service is to extend the array of services that are on display. Instead of limiting yourself to buying big ticket items or daily groceries, the question was why this kind of site limited itself in this way. The logical answer was to offer a comprehensive list of services – from lawyers and contractors to photographers and artists – that people could easily access, contact, and connect with. The best way to go about this was unclear, but thanks to the rise in social networking sites, the answer was revealed. And so MiNeeds was born. What it offers users is a network of professionals, offering a myriad of services, to any interested user. Think of it like an online telephone book, except that you can read in-depth descriptions of each professional service, take a look at their track record and reviews, and contact companies without being obligated to pay quotation or consultation fees. All you do is create an account of your own, and get looking. To use the ultimate sales cliché, there is even more on offer here. Not only can you search for local professionals that you may be in need of, but you can also offer your services at the same time. So if you run a small photography business, you can set up a profile where people can view your portfolio, and contact you for work. There are a number of sites similar to this one out there, but none offer the kind of comprehensive service that MiNeeds does. You might have a similar profile of a site like Freelanced.com, but this is freelancers only and is more socially orientated. MiNeeds has a massive amount of users, operating the system from both sides, and they reward those who do well with automated “top performer” lists. They are much more aimed at a successful business partnership, so if you are looking for something a little more exclusive and business driven, then yes. If you are based outside of the United States, do not waste your time – these professionals are all only local, which is quite disappointing. Victoria is a blogger who writes about a ton of different topics including the high protein low carb diet. Well all was well until I read your last comment! Someone needs to get things going in the UK for something similar to Mineeds, after all Yellow Pages is archaic. We are in the dog training harnesses business for example and need to interact with dog trainers who have good reputations to work with our products. Anyone going to take up that challenge?